Disclaimer: The links in this post are affiliate links. I purchased rings of my own for review. As always all opinions are my own. A while back I was invited to join Enso Rings as an affiliate. I like to be picky when it comes to companies that I work with because it’s important to me that I share only the best with my readers. I also wanted to test the product for myself before introducing it to all of you to ensure it was a quality product. Enso rings is a fairly new product. They began their company as a kick starter, how awesome is that? I just love this symbolism because I truly believe that marriage is two people coming together as one. If I’m not going to wear my own wedding ring, I at least want to wear something that symbolizes the love that my husband and I share as well as the life we’ve built together as one family. I’m a pretty symbolic person, can you tell? As triathlete I spend a great deal of time in the pool. The most expensive problem I have is my wedding ring. 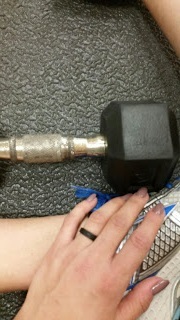 I thought it was a great idea to purchase a micropave wedding band before I became a triathlete. Now that I’ve lost a few of my tiny diamonds in the pool, I’m second guessing that decision. After complaining to my husband for countless hours he finally asked the question, “Why don’t you just take it off?” Well why don’t I just tattoo my “Single” on my forehead while I’m at it? I hate taking off my wedding band about as much as I hate losing diamonds in the pool. When Enso approached me I thought their product would be a great solution to my swimming troubles, but as it turns out these neat little rings are great for more than just swimming. My husband works with his hands on a daily basis and is also an avid gym goer. The callouses his wedding ring leaves are nothing short of scary. Not to mention during the work day his hands and fingers tend to swell causing deep impressions to form around his band. He never complains about it hurting, but I’ve seen him take it off and you can clearly see the inner pattern branded on his finger. Like my ring, his ring is also micropave, we purposely purchased his ring with diamonds only half way around the band. We wanted to ensure the inner portion of the band that is most exposed to work elements wouldn’t suffer from the abrasive materials. As you can see, his ring has still taken a beating. He was more than willing to give the Enso ring to chance when I told him they were made of silicon and stretched. I purchased the Ultralite Silicone Ring in the color Obsidian for him and the Infinity Silicone Ring in Obsidian for myself. Honestly, I wanted the Women’s Ultralite Silicone Ring for myself, but for whatever reason they do not offer that ring in my size (5). Kind of a bummer, but the Infinity ring worked great. I liked the thin design even better. We couldn’t recall my husband’s wedding band size and our initial order was a bit too small for his finger, but Enso was great with our exchange. I just shot them an email with the correct size and they mailed it to us with a return label included so that we could send the small one back. It was super easy and quick as well. Something I can totally appreciate when ordering new goodies. No one wants to wait to play with fun new toys! Once we both had a good fit, we began testing! I wore my ring everywhere in the beginning and never took it off. I absolutely loved it. I never noticed how often I pulled out my hair with my wedding band until I could run my fingers through my hair with the Enso ring on. Funny story: When I blow dry my hair in the morning my wedding ring constantly snags the on/off switch and turns the blow dryer off. I bet I turn it off and on at least 20 times in one sitting. It’s the most frustrating thing in the world! Problem solved with my Enso ring! It’s flat and smooth so there’s nothing to snag the switch! I also wore it to the gym and the pool. What I loved was that it never felt loose or like it would fall off in the water. It was also great post swim in the shower. I was a little worried that the silicon material would pull on my wet hair, but it was the exact opposite. It seems to glide through without tugging or pulling. Now that weather is creeping up in the 90’s here here in Texas, my fingers tend to swell at the end of long runs. I’ve been training mid-day in 90+ degree heat and my fingers look like little sausages when I get home. It’s nice when I wear the Enso ring because I don’t have issues with the band cutting into my skin. The most rewarding part of wearing the Enso ring came with open water swimming. I have a tendency to hold my fingers close together when in open water for fear of losing my wedding band. I’m constantly checking to make sure it’s still on my finger which can really throw off form and slow me down during a race. It was nice to not have to worry about that while wearing the Enso ring. It stays snuggly in place, even in cool open water when my fingers shrink. Overall I’m very happy with Enso! Their site offers so many designs and has introduced a new line of stackable rings which means now, I can match my rings to my tri suit! The possibilities are endless. To show my support for Enso and to share the love with all of you, I will be giving away an Enso ring to one lucky winner. You have your choice of any single regular ring or you can choose the two ring stackable bundle. All you have to do is enter through the Rafflecopter below! The winner will be announced on Friday 07/29/2016. You can enter once or use all four entry methods to increase your chances. The winner will be contacted via social media entry method on Friday to discuss color/size and shipping.